We just finished day 8 since arriving in the study area. It is Friday 11 December 2015. Today our focus was on the south-east of the study area (see map below). Focus area for the RV Solander today. Yellow and orange lines show where we used the towed-video system and collected critters from the sea floor. The red X shows where we were buzzed by sharks. One of the first tasks for the start of each day is to take measurements of the ocean water’s key properties: conductivity, temperature and depth. Both conductivity and temperature affect how quickly sounds move through water. Knowing their values is thus important for making sure our multi-beam instrument is set up to work correctly as we map the sea floor. We measure these properties repeatedly each day using an instrument we lower into the water called a CTD, as shown in the picture below. The CTD instrument being lowered into the water using one of the Solander’s strong winches. As you can see in the photo above, the sea today (as on several other days on this journey) is calm. Without a gasp of wind to stir the water, these quiet seas earn a 0 on the Beaufort sea state scale which measures how wavy the seas are. When the Solander is not moving (as in the picture), the seas are so still that you can look through them almost like a window to the deep – this is sometimes called ‘glass-out’ conditions. 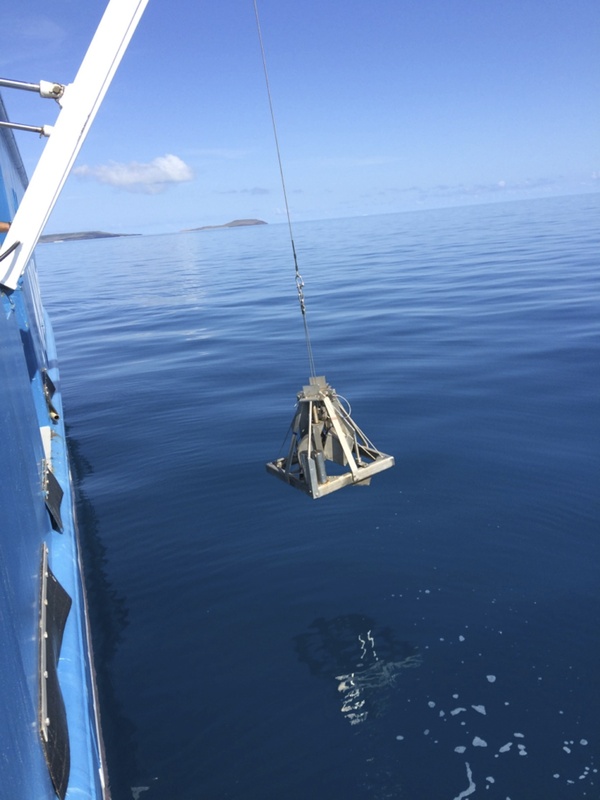 The reflection of the sediment grab instrument is clearly visible in the very calm seas. Because of this, when our instruments in the water caught the attention of three sharks, I was able to see them clearly through the water! As we lowered and retrieved the CTD and the sediment grab, three sharks repeatedly circled around the boat (see picture below). Can you find all three of them? Two of them are harder to see because they are deeper underwater. But all three are below the sea surface. 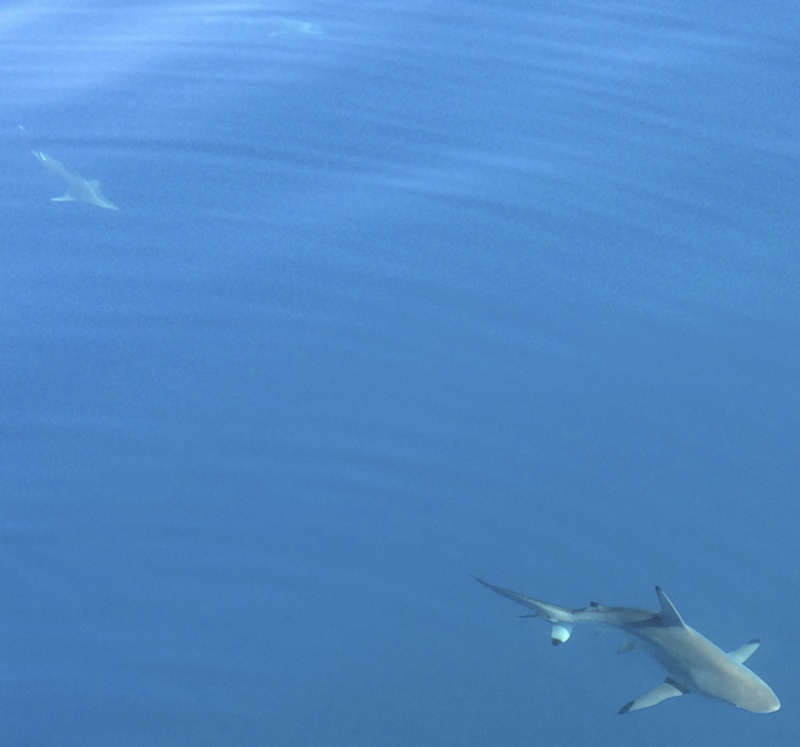 Three sharks swimming around the RV Solander while we stopped to take water measurements. Close-up view of two of the sharks through the water during ‘glass-out’ conditions. 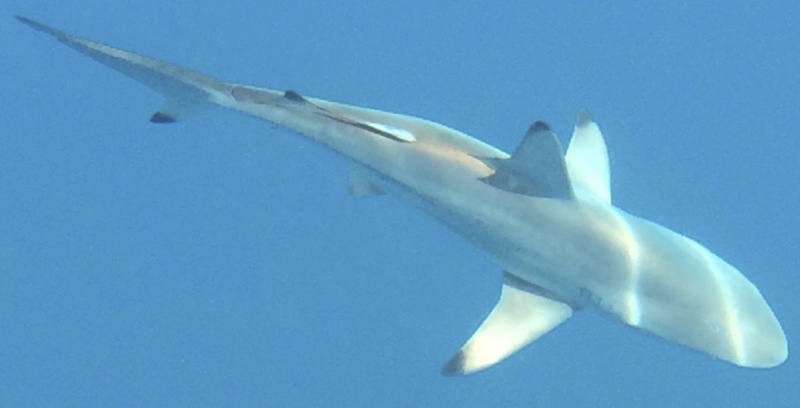 Spinner sharks got their name because they often spin around at high speed towards the sea surface trying to catch fish. Sometimes they leap out of the water still spinning, as you can see in the video below. AIMS have not been able to video or photograph spinner sharks leaping out of the water, but we’ll keep trying. Our tow-vid technician (Niall) has seen them leap out of the water repeatedly over the past few days. 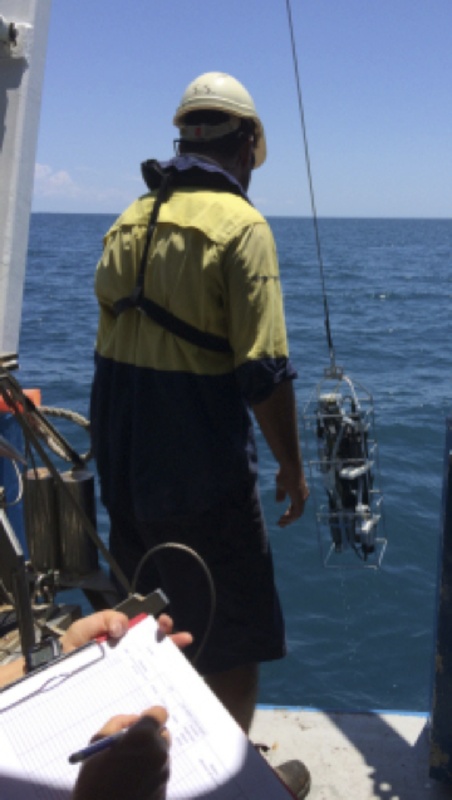 They sometimes chase the aluminium frame of the tow-vid system as it is winched to the sea surface. That gives me a good reason to put on my life vest, hard hat and steel toed boots so I can watch for them on the back deck! On average, spinner sharks are about the length of a typical adult human is tall (195 cm). The longest spinner shark ever measured was 278 cm. No human injuries or deaths have ever been reported from spinner sharks. Mother spinner sharks carry their babies for 12 to 15 months instead of the 9 months for human mothers. 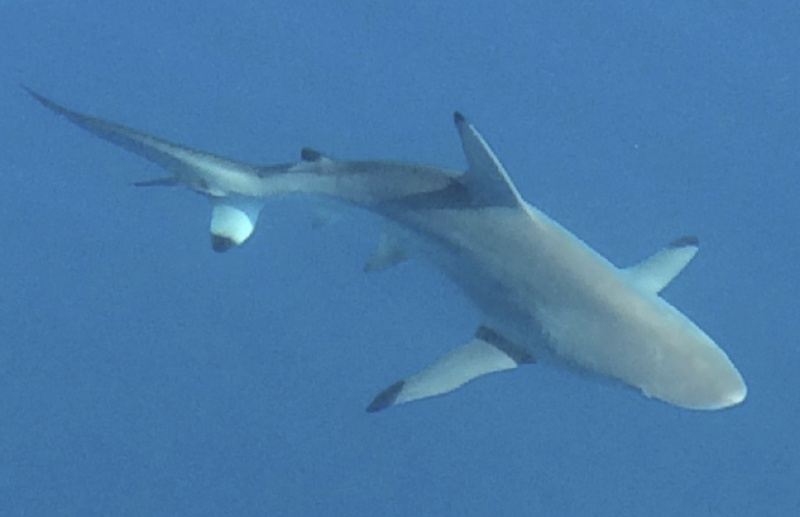 Spinner sharks prefer to eat fish that swarm. That may be why we are seeing them – remember from my last blog that we took underwater video through a fish swarm yesterday.